One Year of Back Issues: Laura F.
I'll be sending you an email shortly, to let you know that you've won! Congratulations!! Both of the things I want to share with you today were supposed to be included in my week of "baby celebration", but because of timing, they didn't fit in the week. So I'm really happy to share them both with you today. 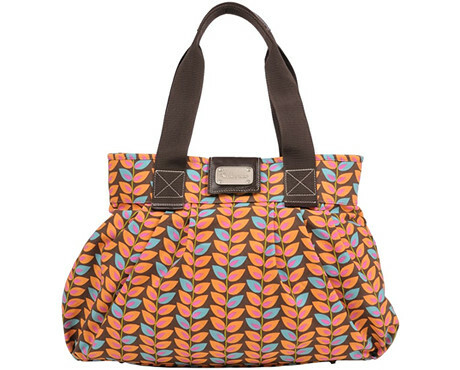 The first is this great new bag called the Samantha Diaper Tote from Kokopax. It is my use-every-day diaper bag with Birdy and I love that fact that you'd never really know it was toting diapers and extra onesies and burp cloths, unless you peeked inside. So many people have commented on how much they love it's size, style, design without even guessing it falls under the category of "diaper bags". That's my kind of diaper bag. The bag is made of 100% cotton canvas with a water-resistant lining. It is full of pockets inside including a zipper pocket and elastic pocket for bottles or sipppy cups. It has a strong magnetic closure and is roomy without being cumbersome. I really love using it. I've really scaled back my magazine subscriptions but one that I still really enjoy for it's inspiration, philosophy and ideas is Living Crafts magazine. "Living Crafts is a community of readers who value the work of their hands, use natural and organic materials, and live an authentically holistic lifestyle. Living Crafts provides craft enthusiasts with the information, ideas and inspiration they need to support their desire for self-sufficiency, sustainability, and a natural lifestyle." Thanks to the generosity of the folks at Living Crafts magazine, I am excited to give away one year of back issues and and one year subscription to Living Crafts magazine. Leave a comment on this post to be entered and I'll pick the two lucky winners on Friday! Good luck! Living Crafts sounds wonderful! I have not seen it before but will certainly be looking for it-thanks for sharing your enthusiasm for it. Looove the bag AND the magazine! Please put my name in the hat! Thanks for sharing! The diaper bag is so cute! I would love to win either copies or a subscription to this magazine. I have not seen it yet but have heard some great things about it. Thanks for the chance to win. oh, I’ve never heard of living crafts, but it sounds lovely! I’ve been wanting to subscribe to living crafts but have not had the extra $, so thanks for the chance to win a subscription here! What a wonderful giveaway– and that magazine in new to me– off to check it out. Well, I’ve always wanted to read the Living Crafts magazine, but the money hasn’t always been there. Would be great to win. Sweet! Crafty magazines are the best! Another great magazine I’ll have to go check out! And that bag is adorable – I’ve been using my husband’s man bag all along since I hated my first purchase. Off to scope out the website..
what a great magazine. count me in! Fabulous bags! I’ve got two baby showers to attend soon~~great idea! what a find – I’ve never come across that magazine! and the bags are stunning. Our local libraries don’t carry Living Crafts and with our budgeting I can’t afford it, but I’d love to have the chance to receive it for a year! Ooh! I love crafts, I hope I win! That diaper bag is really cute. I’m gonna have to check ’em out! I loathe kiddie-looking bags. I usually just toss everything in my purse…it’s kind of a mess. Enter me please-these are great giveaways! This magazine looks great! I’d have so much fun crafting with my girls. Thanks for the chance to win. The magazine will inspire me to be more creative with my children. That diaper bag looks very cool. It would be great for the new baby and toddler plus mommies stuff. The diaper bag is very cool. I would love to win the Crafts magazines! I have been wanting to subscribe to this mag but we are in the middle of a move and money is tight. Would love to win this giveaway. I really want to read this magazine… I’ve looked in local stores but can’t find it. So I’d love to win! What an awesome “diaper” bag! Would love the magazine too! The diaper bag is awesome! I’m thinking that’d make a great gift for my friend who is pregnant with twins! The magazine looks like it’d be great also! I love reading magazines because they seem to fit well into my schedule and I’m always looking for inspiration! Those diaper bags are very cute and I just love living crafts magazine. I really find so much inspiration in it. 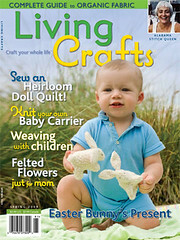 I’ve been wanting a subscription to Living Crafts for a while now, but don’t have the resources at this moment. It would be lovely to win a subscription! thanks for the diaper bag rec – sounds like my kind of bag! and that magazine is one I’ve had on my wish list for ages but never actually pulled the trigger on. Very cool!And awesome diaper bag. I’m counting the days until I can goodwill our Lands End diaper backpack! I would LOVE to win the living crafts subscription. Such a great magazine. Have always wanted to try Living Crafts. Would love the chance to! That diaper bag is adorable. Lots of goodies to be had! I love stealth diaper bags and those are some good looking ones! I also saw that magazine while checking out somewhere the other day. I wanted to pick it up, but I had an armful of wiggling baby at the time. I’d love a chance to see it up close! My kids aren’t in diapers anymore, but I’d still use that bag! Great for snacks, water bottles, crayons, and other “big kid” stuff! Adorable bags! Would love some new craft ideas too. The magazines look awesome. I almost salivate at the thought of opening a new (to me) creative tome. Count me in for the contest and I’ll wipe my chin off! I would love to be entered for the Living Crafts give-away. Thanks so much for offering it. Would love to win a mag subscription! Great giveaway! I have been wanting to subscribe to Living Crafts. I have been picking them up here and there, and always love them! And that bag is adorable. My baby sister is having a baby soon, and she would LOVE this….or maybe I would keep it for myself. It is adorable! Sounds cool – I will check it out! That looks like an awesome diaper bag! I like the outer fabric choices. Man, that bag is rockin’! I use a Moop but I’m loving these prints! I already subscribe to Living Crafts magazine . . . it is a terrific little publication! Would love to check out the magazine. Always on the look out for inspiration. I’ve never heard of this magazine. I’ll have to check it out. Those diaper bags are super cute! Living Crafts is an inspiring mag. I would love to win this giveaway! Oh wow! I’ve never heard of Living Crafts, but it sounds perfect! 🙂 I am loving that diaper bag style as well. Thanks for sharing! What a great giveaway. I’ve been wanting to see Living Crafts for a long time now! I could use some creative inspiration in my life right now. Would love to enter to win. Thanks! Living Crafts sounds like such a neat magazine. I get so much inspiration through magazines and I’m always looking for neat stuff to do with and for my soon to be two yesr old daughter. Thanks for the chance to win a subscription or the diaper bag, so fun! Those diaper bags are CUTE! And I’ve wanting a subscription to Living Craft for awhile now. Thank you! I’ve been meaning to get my hands on a copy of Living Crafts! I’ve heard so many good things about it! Thanks for the opportunity! Count me in! I’ve never gotten my hands on that magazine and it looks inspirational. Also, love the bag! what a fun giveaway! the magazine looks right up my alley! 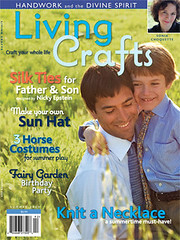 Living Crafts sounds like a great magazine. I’ll definitely go check it out! sounds like a wonderful mag! Ooooo…I would LOVE the Living Crafts magazine! Your blog is GREAT…and I also love “Habit”. Thanks for sharing your life with us. Oh I would love to win a subscription to this magazine!!! I have been dying to get my hands on a Living Crafts magazine! What a great giveaway! Thanks! Thank you for the giveaways! I would love to learn more about the magazine, and the diaper bag is too cute! Enjoy your family, I sure enjoy reading your blog!! Looks like a wonderful magazine and a great diaper bag! I splurged and bought one copy of Living Crafts, and really like it…keep going back to it. Thanks for the generous give-a-way would love to win. love that new diaper bag. would be great for the new baby coming in the fall! How did you find it? I love the feminine style to it. 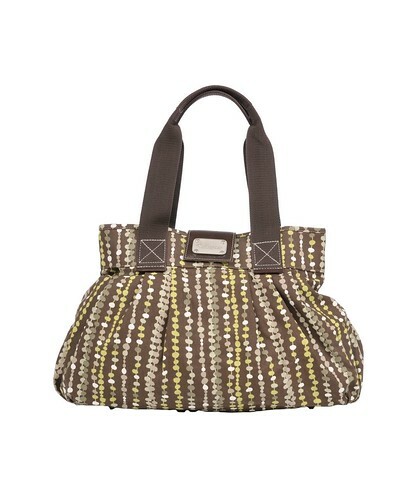 It’s hard o find a stylish diaper bag that isn’t too girly (when you have boys). this is perfect! Wow, what a great giveaway! I’d love those magazines. hey, this looks like a great magazine! thanks so much for the opportunity to win a subscription, molly! Oh those bags are fantastic and I am a big fan of the magazines too- fingers crossed! I have read just one issue of this magazine years ago and haven’t seen it around since. Now I am inspired to read it again. As my kids grow I find that I actually have time to be crafty again. I love that bag! My babies are teenagers now but that would make an awesome beach bag.Living crafts is my favorite magazine.Thanks for the chance to win! I picked up a copy of Living Crafts at Whole Foods some time ago, and you’re right! It is a great magazine. I would love to have a set to peruse during my (fleeting) time to myself this summer. What fun!Thanks! ooh! i’m going to need one of those bags very very soon. and the magazine looks nice too. I was given a copy at Green Fest in SF this year. It’s a great magazine. I’d love a subscription. I LOVE LOVE LOVE this magazine! Would love to win. Thanks for the amazing opportunity!!! both gifts are so lovely! I would love to win either! I just discovered your site via ‘habit’ via ‘are so happy.’ I’m delighted to find you. That’s my kind of diaper bag too. . . the diaper bag in disguise! I have borrowed a few copies of Living Crafts magazine from a friend and loved them. With a baby coming in 18 days or less, I just realized that my old Diaper bag from Kid Number One (a simple Kate Spade bag)has become my knitting bag! oops!! I guess I need to do some shopping!!! Can’t wait to check out the magazine–looks awesome! I’ve been eyeing that magazine for a while now…would love to win a subscription! Those diaper bags are terrific! I have struggled to find something subtle and ended up sacrifcing style…off to check out that site! What a nice magazine and it has a great topic inside. Love the giveaway (and your blog). Thanks!